The 1953 Hamilton Ryan was produced for two years and it's a very unique model. There's a couple of reasons for calling it unique. First is the variations that were offered and the second is it actually has two different movements over the two years of production. I was surprised to learn that, myself. The Ryan's case is 10k Gold Filled, mostly in yellow but also in white.. The sterling silver dial has solid 18K gold roman numerals and markers. The dial actually came in two options, a two-toned white butler dial or a black nickel finish dial. That makes for an interesting watch in its own right... different colored cases and different colored dials. I always thought the Ryan came only with a 12/0 sized, 17 jewel 752 movement. However, I recently restored a Ryan-B for a friend in the UK with a different movement. When Hamilton discontinued movements but continued the model, they added a "-B" to the model name. There are lots of -B models but they were not usually listed in the catalog though. I always thought there was just a Ryan but that is not the case. The Ryan B has a 17 jewel 747 movement - which was produced before the 752 was introduced and also after the 752 was discontinued. So I would assume sometime in 1954 the Ryan-B was made. 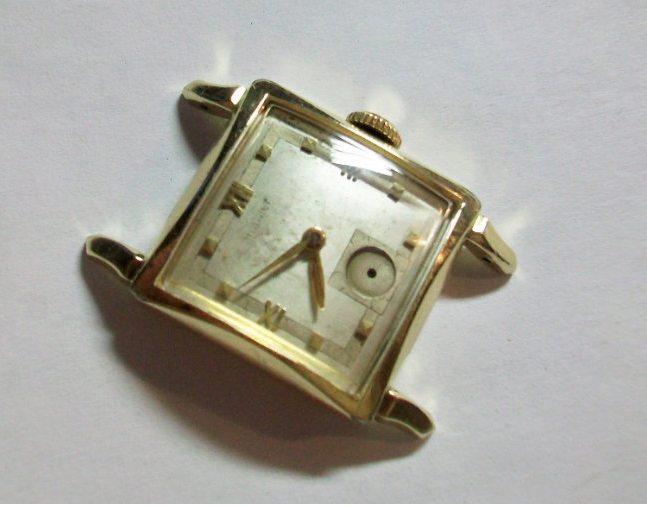 As received, the watch I restored was in fairly good shape but the dial was faded and lost most of it's markings. It was missing the second hand and the hour hand was incorrect. It didn't run very well either. Other that that, it was great! With a fresh redial, a thorough overhaul, and some new hands, this Ryan is ready for more wrist time. It is currently "crossing the pond" on it's way to England. UPDATE - Jan 2, 2015 - I happened upon another Ryan-B, this time with the white gold filled case and an original black dial... very nice! Your best bet is to keep an eye on eBay. The Ryan is a fairly common model and can usually be had for under $100 in unserviced condition. So you can double that for a nicely restored example. I purchased a Hamilton Ryan with the black dial and gold case about 5 years ago for $49. It came without a strap, which I purchased from my local Hamilton Agent. A couple of years ago it developed some "hiccups"--running fast--and I stopped wearing it. Most recently I wore it for the first time in a long time to test how it would run. It has run flawlessly since. I have grown to appreciate the beauty of this watch all the more. 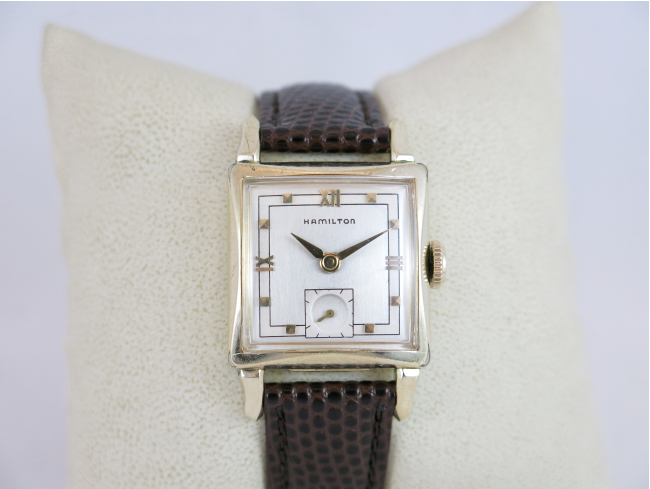 It has an Art Deco kind of motif in its design and captures the zenith of Hamilton's watch design during the 1950s. It is one of six working Hamiltons I own. The Ryan, Blair and Ashley models are originals as is the nonworking Boulton. The Lloyd, Piping Rock and another Boulton (original size, not Boulton II) are reissues. I meant to mention that mine was an EBay purchase, confirming Handy Dan's observation that it is commonly found there. One more thing--like Columbo used to say--I forgot I also own an original Hamilton Turner I purchased from my local Hamilton dealer two years ago. I found a Hamilton Ryan 752 at an antique store a short while ago, and I'd been wearing it until the movement just kind of quit. I looked under the hood, took a couple of screws and wheels of of the mainplate and there aren't any defects. Taking it to a professional would cost an arm and a leg. What should I do? Could you put a 753 or 754 movement inside of a Ryan case? 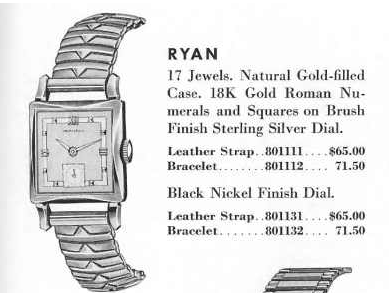 Or a 747 on the original Ryan dial, since that's what a Ryan -B is anyway? The 8/0 747 is a different size than a 12/0 752 or 753, so the dials are not interchangeable nor are the cases. Might you happen to know which crystal a 752 movement Ryan takes? Look on eBay. You will find one, at least in plastic, and contact one of the various sellers directly if you want glass. I might already have the crystal. A while back, a local jewelry store owner had two large drawers of square and rectangular crystals, mostly from the 50's. It had the crystals that the brand made themselves. 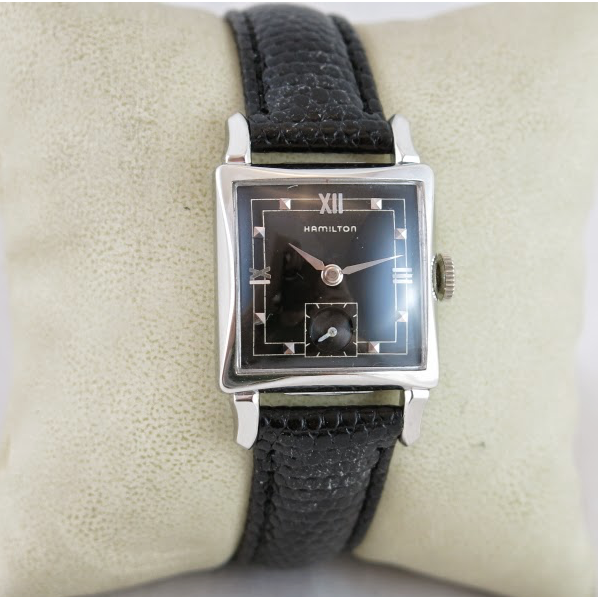 The brands were Hamilton, Elgin, Bulova, and Waltham, mostly.There was a sticker on each section or "tray" They read, from the top down, " MX: MH: MO MF: MT8-225" and the next one was, "MT: MX20-204" then "MX11-227" then "MX: RM268" and finally "R:T7-132, MX209-275". Id like to know how to identify the crysal with the model of wristwatch. each of the trays contain small boxes, each box with a label that tells which brand the crystal fit ( Ex: Hamiton) and the it ould say the model of crystal ( Ex: Hamilton MX17-229). I would like to know the model number of crystal that the Ryan took, if you happen to know that yourself. Crystals are surprisingly complicated. Not only is the shape important but also the contour of the sides. You need to measure the width and length at the center and then go from there based on the shape and contour of the sides. You could try a CMS400-5 and possibly an MS400-5 for the Ryan. Thanks for the info! By the way, your blog is excellent!